Introduction: Since the evolution of mankind, man has used his intelligence and creative instinct to develop things that will reduce his labour. He shaped bowls, tools and weapons out of stones and wood which was naturally found in nature.With the passage of time he discovered other element in nature like gold, silver and copper which were readily available in nature in the form of nuggets. He melted and shaped these metal according to his desires. He probably discovered gold pebbles with stone and copper from the copper bearing ores that line the fire pits. He found it easy to melt the iron, copper and gold using the firewoods and charcoal, and hence in differerent ages iron and copper became the most profusely used natural materials. Evolution of casting process: Gold, silver, copper, iron, lead, mercury and tin are known as the 'magnificent metals' since they were known to man from ancient times. The basic process of melting of metals in furnace, using patterns and soldifying the metal in mould has remained the same. Some ancient techniques like the lost form techniques and bell casting techniques are still religiously followed. Furnace: The earliest furnace were simple and easy to operate, with beewax used for patterns and bellows for blowing air into the furnace. In the iron age probably ceramic ovens were used to melt the metals. Crucible and later flame ovens were available for the melting of copper, tin and lead alloys. Molds: Diferent types of mold made from clay, wax and loam were known from the early times. The lost form technique was also prevalently used from the early times. Patterms: The first patterns of casting were made probably 4000 years in mesoptoamical from beewax. A frog casted in copper is the oldest living proof of intricate patterns used as early as 3200 B.C. Core were also used to provide intricate to the interior of the cast. Different Ages of Casting: According to Biblical records casting technology can be traced back to 5000 BC. It is possible that metal casting technology, using moulds originated in the Middle East. However, there are suggestions that this process may have been developed in India and China. It is said that the first steel products were made in India in 500 B. C., but the process was lost. The earliest records of casting methodology are the writings of monk Theophilus Presbyter in his book Schedula Diversarum Atrium. He has described in detail the casting of the famous Perseus and Head of Medusa. » Copper Age (7700-3300): Stone age is followed by copper age in the prehistoric times. Mankind found copper in the fires from copper-bearing ore that he lined his fire pits. Copper found an instant liking with man because it can be melted and molded into any desired form. So, using clay as mold and bee wax for pattern, he desinged householod good, weapon and religious times. The earliest living proof of copper was the weapon found with Otzi, the oldest naturally preserved mummy from 33000 B.C. Otzi carried a coper axe which seems to have been metalworked by the worker of his tribe. Archaeological evidence suggests that copper is among the earliest metals used by humans. Numerous digs all over the world indicate that copper was used to make utensils, jewelery, and weapons. Copper is highly ductile, meaning that it can be easily worked and pulled into wire. For cultures which had minimal or crude metalworking abilities, copper would have been easy to shape and work with. » The Bronze Age: (3300-1200): Eventually, he learned that tin could be mixed with copper to produce a stronger, durable and attractive metal which was called bronze. He found bronse favorable because it coule be use to make artefacts and toolls like knife, armor, pottery, that we more durable and harder. In the early part of the bronze age the naturally found bronze alloy was used, which has arsenic as an impurity. Tin bronze was used in the later part of the age, since it required sophisitcated techniques to melt and cast the products. Bronze age origninated in Turkey, Iran and Iraq which are known as the caradle of civilization. » Iron Age (1200 BC onwards): Iron age brought the systematic production of metals. The advent of this age in every culture was coincidental in changes in agricultural practice, religious beliefs and cultural beliefs. The Chinese mastered the technique in 1000 BC which they used for the mass production of cast tools and farm equipment. In Europe, the first iron products were casted thousand years later, which included gun-barrels and bullets. » Industrial Age (18th Century Onwards): Also known as the age of technical revolution this age saw rapid increased in the demand for casted products. Mass production was made prossible by the invention of new machines in this age. Iron casting was used not only for the creation of decorative objects but was also for the production of machined componenet and house hold articles. Demands increased tremendously for steel castings with the development of the airplane industry, the commercialization of automobile, mass production of consumer goods, etc. » 3300 B.C. Otzi, the oldest natural mummy had an axe with a copper casted axe head. » 3200 B. C. A frog, cast in copper is the oldest proof that show the complexity and intricacy of molding. » 3000 B.C. weapons and cult objects made of copper of this age recovered from middle east and India. » 1400 B.C. Iron ware excavated, which indicates the earliest production of steel. » 800-700 B.C. First Chinese production of cast iron. » 645 B.C. Earliest known sand molding (Chinese). » 233 B.C. Cast iron plowshares are poured in China. » 500 A.D. 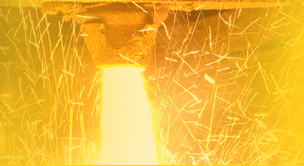 Cast crucible steel is first produced in India. Hot isostatic pressing A manufacturing process used mostly for aluminum-copper series to reduce porosity of metals and to reduce the scatter in mechanical properties. Toolmaker Craftsman skilled in constructing casting dies and similar metal tooling. Riser Riser or feeder is built in the mold to fill with molten material, so that shrinkage that happens during soidification can be compensated. Cope & Drag Top and bottom halves of pattern, flask, mold, or core. Metallurgy Study of the physical and chemical properties of metals and their various. Study is also done of the various applications that the metal can used for. 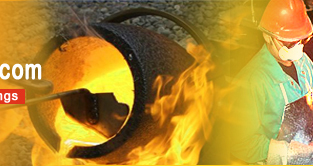 Salvaging of Castings Methods like hot isosatic pressing are used to save discarded or damaged castings for further use. Vents Provision provided in the mold for the escape of gas formed during the casting process. Eutectic temperature Melting point of two more metals that are combined to form the alloy. The melting point depends on the relative proportions of its ingredients. Eutectic mixture Mixture of the constituting elements is such a propotion that all the constituting elements melt simultaneously at a local temperature minimum. Solidus Temperature at which melting begins. Liquidus Temperature when melting is complete. Nucleation A mixture of liquid and substances like clay or plaster of Paris. Slurry Thin mixture of liquid and fine substances such as clay or plaster of Paris. Fatigue Failure Cracking of metal because of repeatedly applying some kind of load or pressure to and from the metal component. For eg. if a metallic needle in bended back and forth for a number of time it will break.